Is Jodie Whittaker already thinking of making her Doctor Who exit? That's apparently on the table, if a new rumor is to be believed. Whittaker made history earlier this year when she debuted as the first ever female Doctor in the history of the long-running sci-fi series. But her historic run may be relatively short-lived as there appears to be a possibility that she will leave the show next year, alongside new showrunner Chris Chibnall. Again, we must caution up top that this is merely a rumor for now and hasn't been confirmed by anyone at the BBC, nor has anyone officially associated with the production confirmed or denied the report. 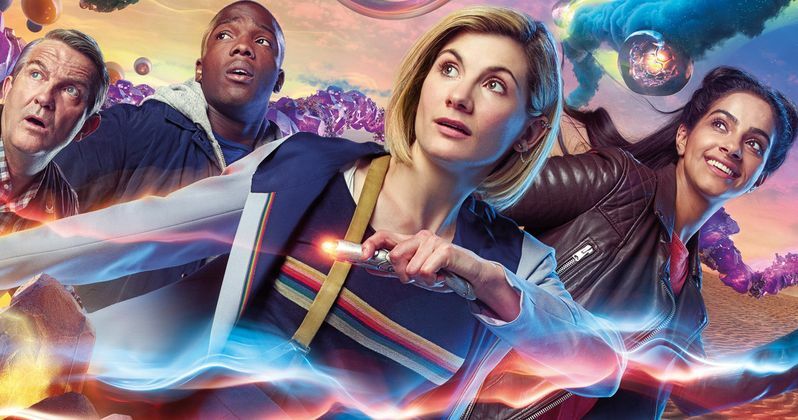 That being said, a new report claims that Chris Chibnall, who took over for longtime showrunner Steven Moffat on Doctor Who season 11, which is currently airing, isn't happy behind the scenes. As a result, he may be looking to depart the series following production on season 12. If that does occur, word is that Jodie Whittaker will follow Chibnall out the door, meaning that the show will need another showrunner and a new Doctor. Jodie Whittaker and Chris Chibnall previously worked with one another on Broadchurch. It's not hard to imagine that they're good working relationship is part of what made this pairing on Doctor Who season 11 possible. It also stands to reason that Whittaker may not be interested in working with another showrunner, someone who she may not know at all and doesn't totally trust, if Chibnall leaves. Assuming there's any truth to this, where does that leave the show and what can we expect going forward? For the most part, season 11 has been received quite well by critics and fans. That means the BBC wouldn't have any issue in bringing in another out-of-the-box choice for a new Doctor to follow up Jodie Whittaker. Does that necessarily mean that we would get another female Doctor? That's tough to say, but it might seem like a step in the wrong direction for them to just go with another white, British male actor in the role following such a progressive choice. As for the showrunner? That's probably the more critical element, as Steven Moffat was the voice of the series ever since its revival in 2005. Losing Chris Chibnall after just a couple of years isn't a great look. In any case, there will be at least one more season with the pair as it's expected that Doctor Who season 12 will arrive in 2019. Though, there are also rumors that it could be for a shorter, six episode season and a Christmas special. Beyond that, the future may be up in the air and we could be in for another regeneration sooner rather than later. If that does come to pass, we likely won't know for some time as the BBC will try to keep that information locked up tight for as long as they possibly can. This news was first reported by Starburst Magazine.